Known for their exotic charisma, natural beauty, and longevity, pebble stones are naturally occurring stones mined from ancient bedrock in Indonesia and other mountainous islands. 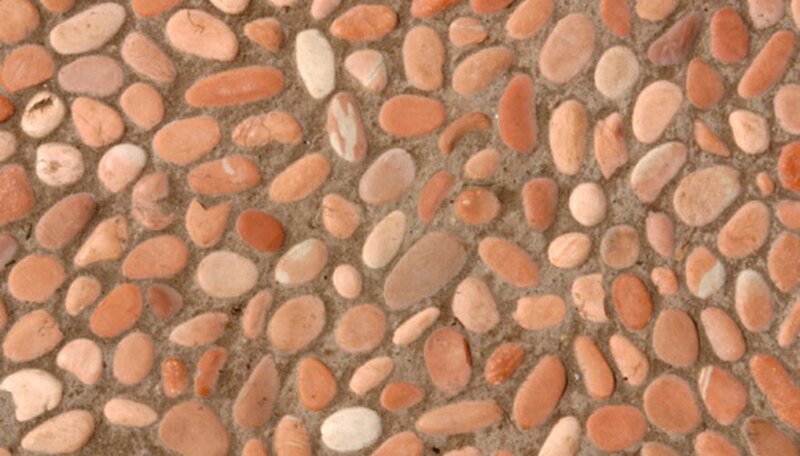 Pebble stone tiles on pool decks and patios add color and texture to landscapes. Like all stone surfaces, pebble stone tiles around pools accumulate dirt and grime, which mar a patio or deck’s appearance. Regularly maintaining outdoor pebble stones prevents grime buildup between individual pebble stones and preserves the deck or patio’s appearance. Properly care for pebble stones around a pool using basic techniques. Sweep the pebble stone surface with a broom. Remove all loose leaves, trash, dirt and debris. Spray the pebble stones with water to flush off dust and other tiny grime particles lodged between individual pebble stones. Pour 1 tsp. of liquid dishwashing soap into a bucket. Add 1 gallon of fresh water to the bucket. Thoroughly mix the dishwashing soap and water. Immerse a soft-bristled scrub brush in the soapy water. Scrub the sudsy brush over a 2-by-2-foot section of the pebble stone surface to loosen dirt and grime buildup. Rinse the scrub brush and soapy pebble stones with fresh water. Continue cleaning and rinsing each remaining 2-by-2-foot section of pebble stones until the entire pebble stone surface is clean. Remember to rinse the scrub brush after cleaning each section. Flush the entire pebble stone surface with water to remove all soap residue. Let the pebble stone deck or patio surface air-dry. What Is a Cool Deck?